Police have arrested a man who they say committed two armed robberies in the Financial District last month. 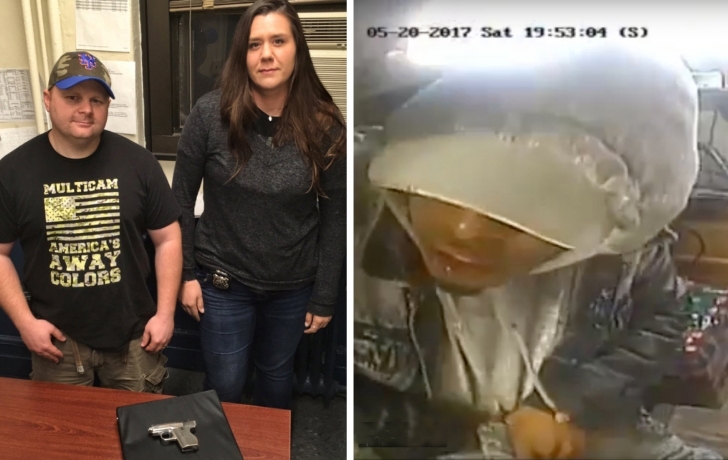 Andrew Suarez, 27, of Manhattan, was nabbed on Thursday, June 15, at 88 Fulton St., in a gated area outside the same newsstand where police say he held up and assaulted the 23-year-old vendor on May 20. During that robbery, police say, Suarez struck the victim on the side of the head with a silver handgun, then punched him in the head, causing a laceration and bleeding, before stealing lottery tickets and $3,000 in cash. In a surveillance video (below), Suarez is allegedly seen stuffing the loot into his pants. After 1st Precinct Officer Michael Erdman made the arrest, according to the District Attorney's office, Officer Brian Flynn saw a 25 caliber handgun on the floor near where Suarez had been standing. Officers Jamie Brantmeyer and Andrew Reyes were credited with assisting in the arrest. On May 31, police say, Suarez held up a smoke shop worker at gunpoint at 135 William St., around the corner from his alleged previous robbery. At that time, they say, he took a cellphone, cigarettes and cash. Suarez was charged with robbery in both crimes, and criminal possession of a weapon and criminal trespass in the most recent incident. According to a police source, officers patrolling the Financial District last Thursday evening observed Suarez and then lost him “in a high volume of pedestrians.” While searching for him, the vendor at 88 Fulton St. notified cops that Suarez was outside the back entrance to his store. The suspect was arrested without incident. He is being held in lieu of $32,500 bail or bond. The lawyer representing Suarez declined to discuss the case.